NOTES: Resin with brass bits. Harry Abbott´s company Battlefleet Models is bringing life and variety to our workbenches and naval dioramas. His motto „Where your Auxiliary Fleet comes in“ wraps things up nicely – he is working on the host of hitherto hardly kitted auxiliary and smaller vessels. He is always interested in modelers´ suggestions re new kits. 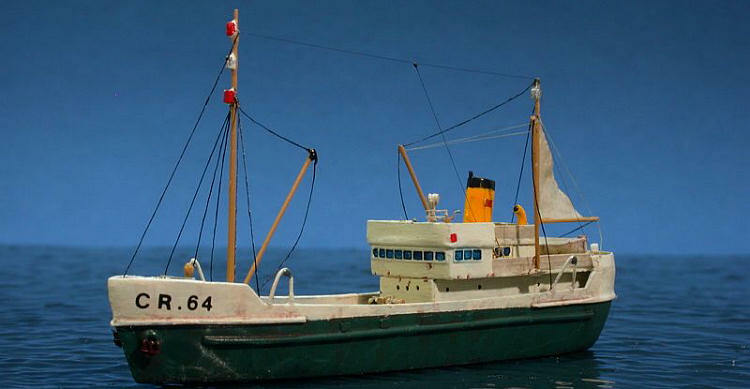 Livia is a generic fishing vessel as they were built in various countries and for quite some time. Harry used the book „Steam Coasters“ by Charles Waine as a reference. „Livia“ is based on SS Maggie as seen on pg. 117. The kit is available in a civilian and military version, armed with a 3in gun and a 20mm machine gun, to be mounted at the bow and on the charthouse. Hence, the kit is an excellent base for a plethora of both civilian and military vessels. Besides normal trawlers, armed trawlers used as escorts, Soviet spy trawlers, even a Greenpeace vessel or an offshore radio vessel can be built. The kit is well packed, which is not a given with resin kits. Everything arrived safe, due to ample amounts of shrink-wrap and bubble wrap. The resin parts are a delight. A crisp master has been molded and cast equally crisply, without any visible defects. The hull is entirely plane, I doubt it will warp. The other parts have been cast on very thin wafers, easing cleanup a lot. 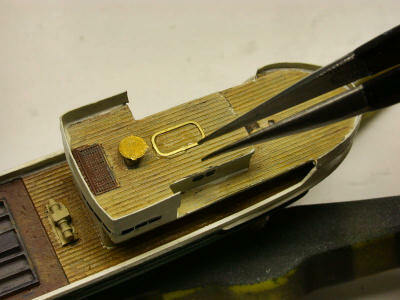 There are alternate parts for the funnel, gun platform, boat and floats provided, increasing variety. I was happy to see that parts prone to damage or loss have been provided with spares – a good idea that can help to keep the blood pressure down during the build. 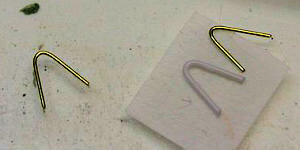 Brass wire has been provided for the masts, no futile attempt at making them from resin. There is a minuscule machined brass barrel for the 3 in gun, made by BMK of Germany. A sufficient amount of PE railing from Tom´s Modelworks has been provided. 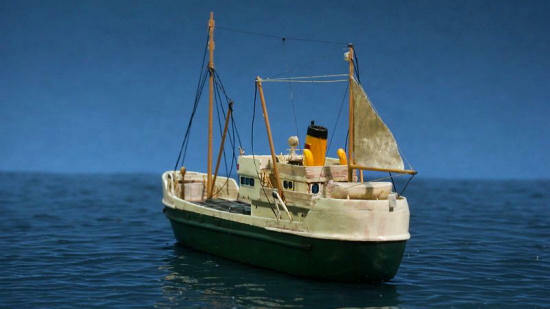 Further accessories as watertight doors, ladders, hatches, cable reels and so on will have to purchased separately, or they are already present in the modeler´s PE collection. The instructions start with a short description of the subject, followed by safety notes and useful hints at working with the materials provided. The instruction proper is brief, it comprises of a parts list and several photos of the prototype – brief yet entirely sufficient. As it is a generic kit, there are neither painting directions nor decals. I for one regard designing my personal trawler as part of the fun. I soon decided to convert my trawler, even though just a bit. I had a post-war ship with some colour in mind, and soon found a drawing in Bjoern Landstroem´s classic book „The Ship“. 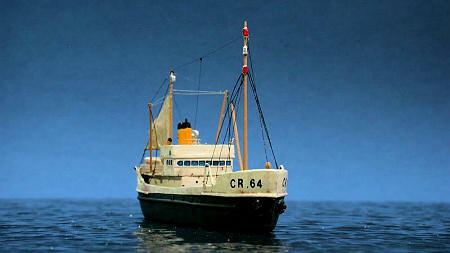 Ill. 777 shows the 19 51 British trawler „Hildina“ I very loosely based my conversion on. Hence I added bulkheads atop the charthouse and the bow, here plastic sheet and CA-reinforced paper were used. The open bridge received a grating with steering wheel, plus a searchlight platform. Several inclined ladders and some watertight doors were provided. PE scuppers, vents from solder plus a brass wire steam pipe were added, too. Again I found L´Arsénal´s PE sets „Structural Parts 1+2“ plus WEM´s classic sets „Askold“ and „Tiger“ very helpful. They contain all sorts of useful things like boat cradles, platforms, tiny rectangles and so on. The masts were made from BMK conically machined brass plus the brass wire provided in the kit, plus very thin brass from kotol.de. The navigation lights were made from tiny pieces of solder. The fishing net derrick supports were made from brass, using the resin parts as pattern. The vessel was painted using acrylics from various manufacturers. The hull was sprayed, the rest brush-painted. 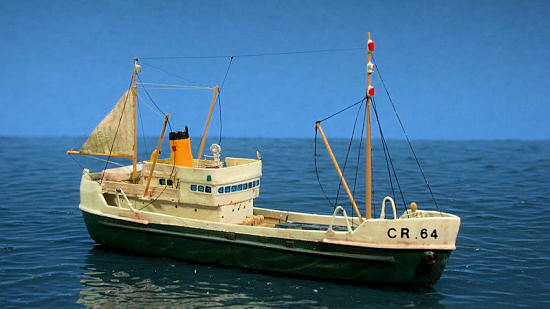 Washing with artist´s oil paints and some drybrushing was used to enhance and weather the hard-worked vessel. As always, the vessel looks worse in the macro images than in real life. The sail was made from cigarette paper, the rigging is UNI fly fishing thread. The registration was applied using dry transfers, while a final flat coat sealed and blended things in. This is a high-quality kit all around, and it is almost complete. The subject is very useful and invites all sorts of conversions. This small kit will be especially well suited for beginners with resin kits, as it is fairly simple and straightforward – and the high quality of the casting will spare the beginner some of the more nasty resin experiences. I hope we will see a number of entirely different built models soon. Highly recommended!